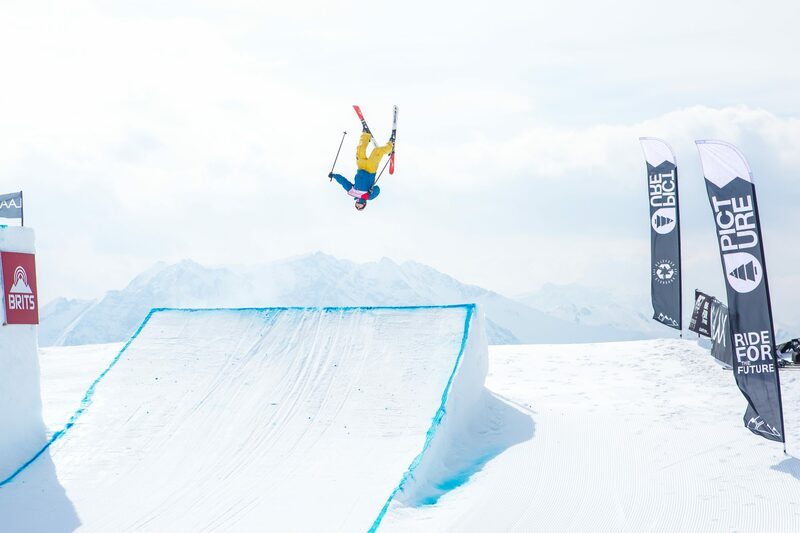 The BRITS 2019 have kicked off in Laax with a fantastic day of competition, with some epic battles on the snowboardcross course and an exceptionally high calibre of skiing talent on display in the Ski Big Air. Winter Olympic medallist and birthday boy Billy Morgan took home the crown in snowboardcross, with Maisie Hill retaining her title from last year. In the Big Air, it was Tom Greenway and Amy Clayton who walked away with the day’s golds after a thrilling contest. Arguably the purest event in freeski, Big Air saw some of the UK’s finest putting down impressive runs and trying out some of their most challenging tricks.With three perfectly groomed kickers to choose from and near-perfect weather, the two-run qualification kicked off proceedings, where Kirsty Muir threw down a switch misty 900 to head a small but strong group of ladies into the superfinal and 17-year-old Tom Greenway led a 12-strong contingent of male skiers in. With the superfinals though, came the wind, which made conditions a little more tricky for competitors. As the skiers practiced before their last runs, fan favourite and second-place qualifier Justin Taylor-Tipton took a spill that ruled him out of the rest of the contest – a blow after a thrilling qualification performance. In the end, it was the number one seed Greenway whose switch double 1260 took the win. Jasper Klein earned a silver with his 1260 Japan and further thrilled onlookers with an enormous double backflip we won’t forget for a while! Harris Booth claimed bronze with another 12, this time with a safety grab. Greenway was happy to start of The BRITS with a win. In the women’s superfinal, it was a battle against nerves and the wind. 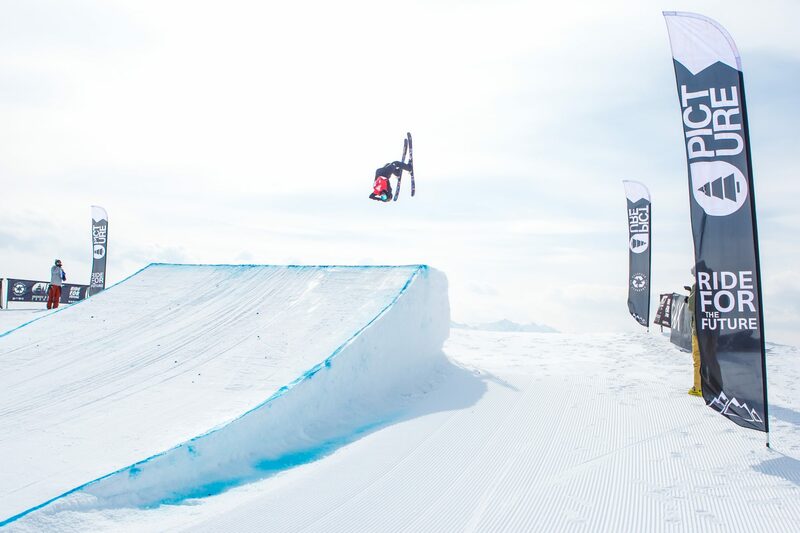 Although Kirsty Muir was the only woman hitting the biggest kicker, she could only manage a 360 and she lost out to Amy Clayton’s much cleaner and grabbed full rotation over the smaller kicker. Kirsty had to settle for the silver and Lara Shaw picked up the bronze with a 720. A firm favourite of the judges and crowds alike today were the father-son duos competing alongside each other. Neil and Luke Burke dropped in within minutes of each other, as did Dan and Simon Abra. Simon – today’s oldest competitor – stunned even his own son when he stepped into skis for the first time in a decade and threw a backflip over the sizeable medium kicker (pictured below). Dan then channelled some of his father’s bravery to get back up and try an enormous double after crashing in his first run nastily, only failing to land it due to his outrageous amplitude. Winter Olympic big air bronze medallist celebrated his 30th birthday in style by taking the men’s snowboardcross gold medal for the second time in three years. Up against strong competitors, some of whom specialise in the discipline, it wasn’t easy for the 2017 champion, who qualified with the second-fastest time. However, Morgan showed that his class in the air can be replicated on ground level and powered to victory ahead of Liam Dobson and Rory Ewart. In the ladies’ final, Maisie Hill followed up her 2018 success by defending her BRITS snowboardcross crown. Having left the 2018 BRITS with a host of medals, Hill qualified almost six seconds faster than her nearest competitor. Joining her on the podium were Cerys Allen and Natalie Good. Some up-and-comers and experienced campaigners featured strongly in some of the age competitions as well: podium frequenter Mia Brookes took out the female under-12s, GB Park & Pipe programme manager Lesley McKenna won the ladies masters, while snowboarding legend Ed Leigh ended up on the men’s masters podium alongside GB Park & Pipe snowboard coach Jack Shackleton. 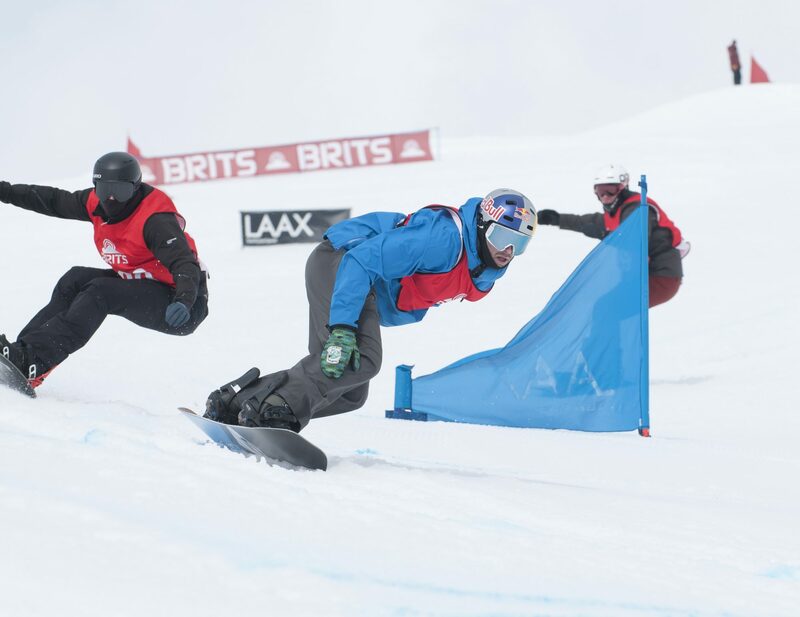 The British Snowboard and Freeski Championships welcomes seasoned pros, budding amateurs and first-timers. For years it has been pushing professional GB athletes, whilst retaining an open-door policy for anyone wishing to give-it-a-go, and more recently for a growing number that just want more than a traditional winter holiday.